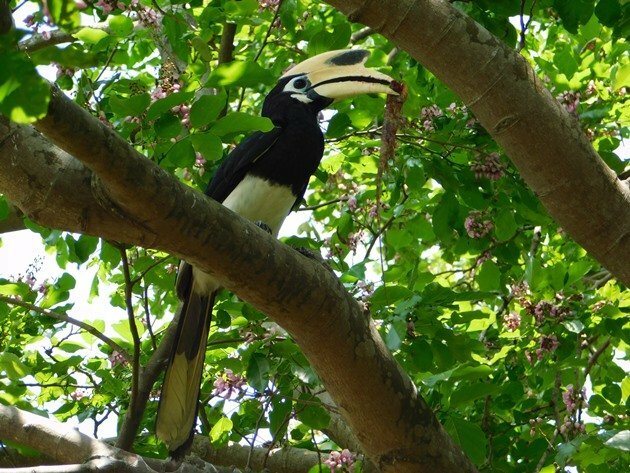 On our recent visit to Singapore we had hoped that we would be able to observe Oriental Pied Hornbills and we were very lucky during our visit. Not only did we observe the bird species most days, but we also had the privilege of observing them at a nest. We were quite surprised by the noise that they made, because it was not too dissimilar to some of the odd sounds a Blue-winged Kookaburra can make in Australia. It was also interesting to note how clumsily the Oriental Pied Hornbill appear to get around the trees and that such a large bird can disappear so easily into a tall dense tree. 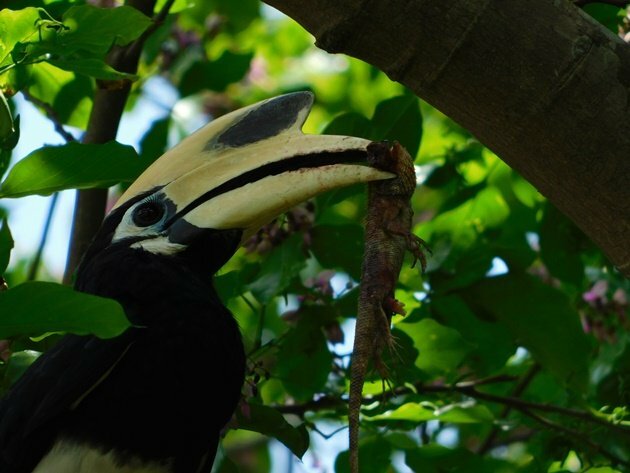 Oriental Pied Hornbills eat mostly fruit and we often observed them in trees feeding or flying clumsily across the sky. 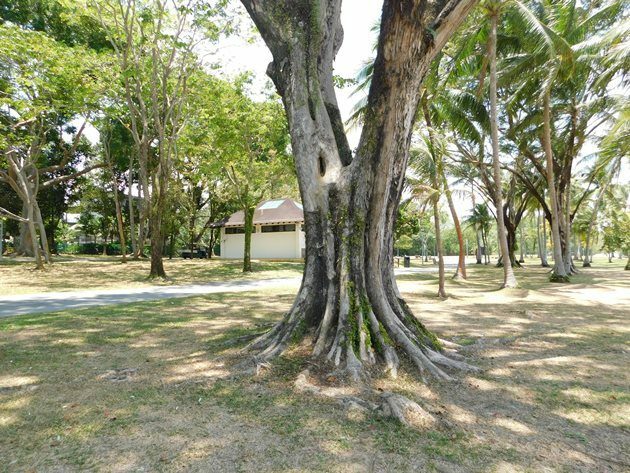 They had been in decline in Singapore and until a few years ago there had been artificial nest boxes installed at various locations. 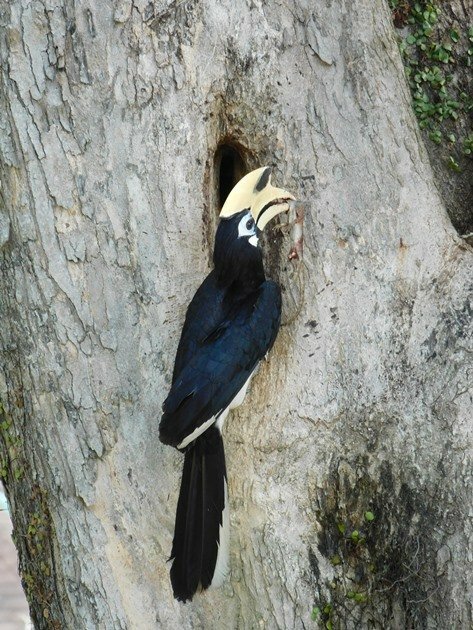 Oriental Pied Hornbills are quite strange in their nesting habits, because the female bird is sealed into a tree trunk during the incubation of the eggs. The male Oriental Pied Hornbill brings food to her and her young and it is challenging getting the food in through the hole to the birds. The nest that we observed the Oriental Pied Hornbills at was about 2 1/2 metres above ground level. It was possible to sit some distance away in the shade of another tree and await the return of the male Oriental Pied Hornbill with food. 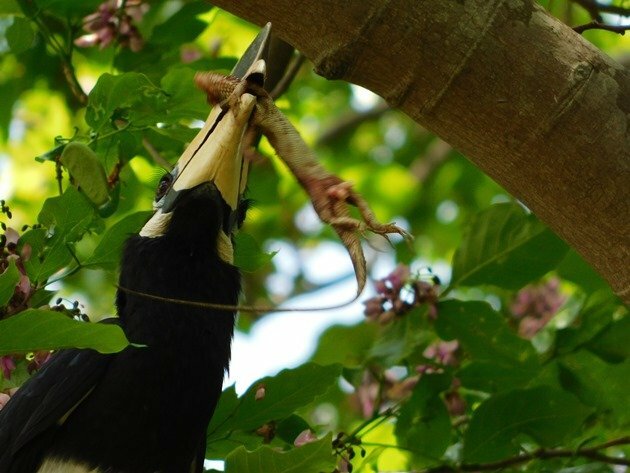 On one occasion the male Oriental Pied Hornbill arrived close to the nest with a Changeable Lizard and initially landed in a nearby tree. It then proceeded to bash the lizard to presumably make it easier for the young to digest. What is quite odd is the presence of “eye lashes” on the male bird below, which we had not initially noticed. The next few minutes were quite a challenge. 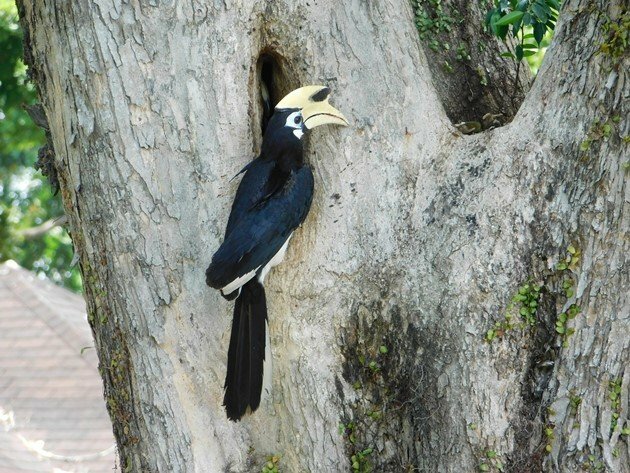 The male Oriental Pied Hornbill flew to the hole in the tree and attempted to get the lizard into the hole. 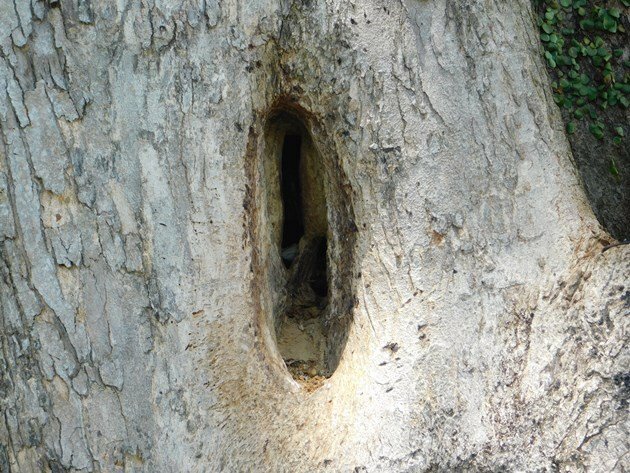 There is obviously very limited room inside the tree trunk for moving around and the size and shape of the lizard made the manoeuvre of getting it through the hole quite complex. It actually took over three minutes of trying to get the lizard in through the hole until the Oriental Pied Hornbill finally lined it up correctly and it went through. 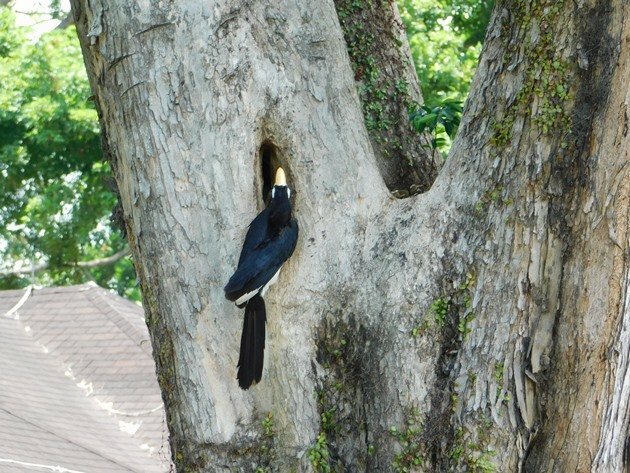 We are unsure how many weeks the Oriental Pied Hornbill will remain in the tree trunk. It could be several months according to some information I have found online. She was sealed in on the day we arrived in Singapore and she was still sealed in on the day we left three weeks later. We hope there is a good outcome for the young and it appears to be a very good strategy for nesting away from predation. That’s an extraordinary bird, and a great documentation of the nesting and how the male feeds his family. Wow! What a great way to spend a hot day. Thanks, Wendy & Redgannet! There was a nice “sea breeze” too!